So here’s another small SUV to add to the large number of SUV options that are out there on the market. The new Audi Q2 is nice to look at, has some great technology, and a build quality that is very hard to beat. The appearance of the Audi Q2 is very much a smaller print of an Audi Q7, Q5 and Q3. Lots of the visual cues come from the Q2’s bigger brothers. High window sills and a low roof line give the appearance of a strong and solid, small SUV from Audi. However, Audi has given the new Q2 a splash of extra boldness and verve, and you can see this with the scallop rear pillar, deeply indented side skirts and fresh taillight arrangement. Of all the Audi Q cars, the Q2 has the most youthful and daring design hints. Out on the road, the new Q2 SUV has a nice ride quality. It remains remarkably quiet and has good composure at everyday speeds. There is not huge levels of ground clearance, so don’t expect to tackle terrain that is too hairy -even with a Quattro model. FWD and AWD models are available to choose from. Take the gravel road home or ski slopes, and the Q2 has good grip and poise. On a practical note, the new Q2 has a handy 405-litre boot space, all ready for swallowing your luggage. It isn’t the biggest boot in the class, however the depth is good and the double-decker floor is a nice feature. If you want more space, the rear seats are simple to fold flat and the volume grows to 1050 litres. Rear seat room is good for two large adults, though it becomes a bit of a squeeze for three big chaps. It’s all very Audi in the Q2 interior, and that means Quality. All the panelling and trim are impeccably put together. Clean design that not only functions really well, it looks elegant and feels nice. One of the big jumps forward that the Q2 has taken for the Audi brand is in interior technology and features. Inside the new Audi Q2 models you’ll find things like Apple Carplay and an Audi connect SIM. The Audi SIM card is permanently installed into the car, which allows access to Google earth, traffic information, online radio, Twitter and email. I like the clever Virtual Cockpit which uses satellite navigation for you to see how tight the forthcoming corners are. One can look at it as being a useful safety feature, as well as material for a bragging binge. Plenty of diesel and petrol engines are available for the buyer; one of which is a 1-litre turbo petrol. A 1.4-litre TFSI and a 2.0-litre TFSI petrol are also available. These are familiar in some of the other Audi sedans. As far as diesel options go, there are two great engines: the 2.0-litre TDI and the very efficient 1.6 TDI. Perhaps the pick of the bunch, the 1.6 TDI, will appeal to most with its low down torque and efficiency. While not a powerhouse, the engine gives the Q2 decent performance. Tried-and-true six-speed manual and seven-speed automatics are the driving force behind the Q2. Both options are very smooth and swift. It’s not hard to get comfortable behind the wheel of the Q2, as there is lots of adjustment for the steering wheel. Good vision through the windows makes for an easy drive. Driver aids for the standard Audi Q2 includes items like pre-sense accident avoidance and pedestrian recognition. The Audi Q2 also has an electromechanical parking brake. Plenty of really good safety features make the Q2 a safe small SUV. There is six-airbags, ESC, ABS, ASR, EDL, Multi-collision brake assist, a tyre pressure warning light, a first-aid kit with warning triangle, seat belt monitoring and ISOFIX child mounts. The Q2 also comes standard with an anti-theft alarm and anti-theft wheel bolts. Interior features boast a long list, so when seated in the very comfortable Q2 cabin you’ll find plenty of things to make the ride comfortable and entertained. Voice control, a 7-inch HD-touch screen, Bluetooth, multi USB outlets, Audi Music Interface and air-conditioning are enough to whet the appetite. Small SUVs are a dime-a-dozen, it seems, however the new Audi Q2 makes a good show of itself. Whether it has enough flair to match some of its rivals, I guess time will tell. I would suggest that if other Audi models are anything to go by, we can expect some high performance Q2 models to show their hand soon. 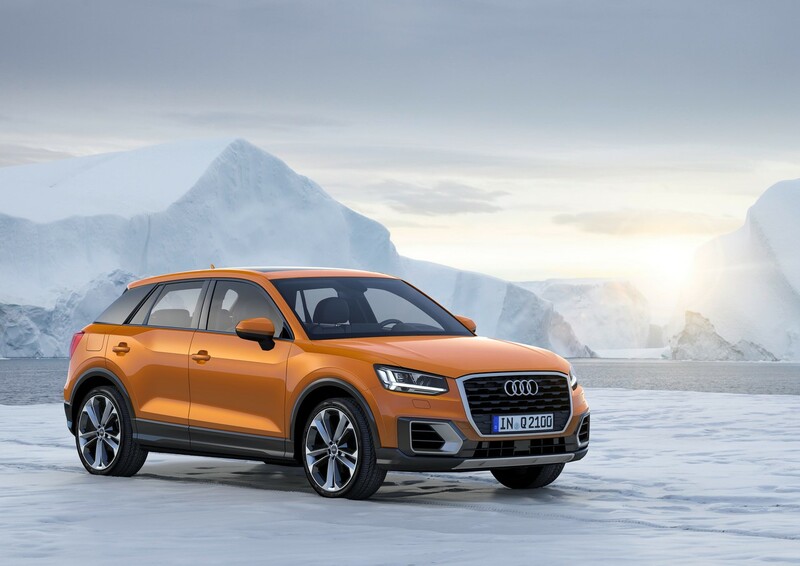 For any more information on the new Audi Q2 or, for that matter, any other new car, contact one of our friendly consultants on 1300 303 181. If you’d like some fleet discount pricing (yes even for private buyers! ), we can submit vehicle quote requests out to our national network of Audi dealers and come back with pricing within 24 hours. Private Fleet – car buying made easy!